A 'true' local, Cheryl brings a wealth of knowledge to the firm. 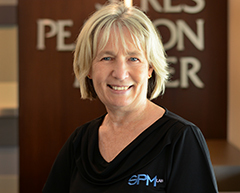 Having previously worked at Westpac, Cheryl has been at SPM Law for almost 20 years, beginning in the Conveyancing department before becoming an integral part of the property department first assisting former partner Ian Miller and now Michael Sobey. In her spare time, Cheryl can be found enjoying long walks along the river with her fur baby Scoot and husband Peter, enjoying the beautiful local sites with friends or planning her next travel adventure.